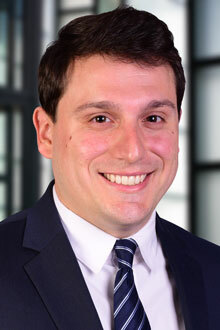 Peter D’Arcangelo is an associate in the Newark office of Lewis Brisbois and a member of the Long-Term Care & Elder Law Practice. Mr. D’Arcangelo focuses his practice on the defense of long-term care and assisted living facilities. He has represented numerous facilities in claims involving decubitus ulcers, falls, medication errors, dehydration/malnutrition, tracheostomy management, and premises liability. Prior to joining Lewis Brisbois, Mr. D'Arcangelo concentrated his practice on defending various healthcare facilities, retail stores, and financial institutions in complex medical malpractice, premises liability and personal injury claims. Mr. D'Arcangelo is experienced in representing clients in all aspects of litigation, including taking depositions, preparing and arguing various motions, drafting Appellate and Federal Court briefs, and obtaining favorable settlements and outcomes on behalf of his clients. Mr. D’Arcangelo clerked for the Honorable Anthony J. Mellaci, Jr., J.S.C. in Monmouth County, New Jersey. As a law clerk, Mr. D’Arcangelo managed the judge’s motion calendar and was responsible for conducting legal research and drafting written decisions on various evidentiary and discovery related matters. During his clerkship, Mr. D’Arcangelo also became certified as a New Jersey mediator and conducted mediation conferences between litigants to facilitate settlement. Most recently, Mr. D’Arcangelo has been recognized as a “New Jersey Super Lawyers Rising Star” in the area of Personal Injury General Defense issued by Thomson Reuters. *The Super Lawyers list is issued by Thomson Reuters. A description of the selection and methodology can be found here. No aspect of this advertisement has been approved by the Supreme Court of New Jersey.